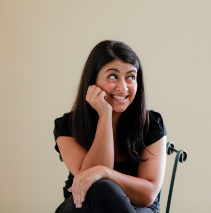 Susie Youssef is a comedian, actor, writer and improviser. She has written, performed and produced comedy for stage, radio and television in Australia and around the world. In 2018, Susie debuted with the Sydney Theatre Company at the Sydney Opera House in Accidental Death of an Anarchist. In December, she wrote and performed in The Smallest Hour with that nice British raconteur, Phil Spencer, in a sold out debut season with the Griffin Theatre Company. She doesn’t update this bio or website as often as she should but she is somewhat better at social media.